The golden age of arcade games lasted between 1978 and the mid-1980s but revolutionized the way in which young people entertained themselves, and paved the way for today's massive gaming industry. With the advent of vector display technology, these new games began taking on increasingly colorful designs, which encouraged young people to flock to arcades, eager to spend their pocket money. Apart from the classic alien invasion games like Space Invaders and mazes such as Pac-Man, many popular games took inspiration from fairy tales and the trend has continued in more contemporary forms of gaming. 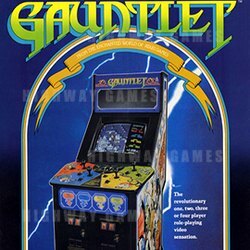 Gauntlet was a classic arcade game based on fairy tale themes. The game was pioneering as it included a multiplayer element, which for the first time allowed arcade enthusiasts to battle each other directly rather than competing for high scores. The multiplayer element of the game was entertaining for the gamers but also had its benefits for the arcade owners as it encouraged kids to spend more during their time at the arcade. Gauntlet creator Ed Logg says that the game was based on the Dungeons and Dragons board game series, of which his son was a fan, and the original title was meant to be Dungeons before the Atari legal team informed Logg that the name was unavailable. The game was innovative for its time and even had a snazzy animated advertisement that ran in theatres. Some modern games have also been inspired by classic arcade games. Take Pooyan, released by Konami in 1982. In this arcade game, a mother pig would shoot arrows at the wolves trying to attack her. Thirty years later and you’ll find Big Bad Wolf, a slot game available on betting site William Hill, featuring characters from quintessential children's fairy tales including the wolf and the three little pigs. This slot machine recreates a unique universe with its straw house, running hills and catchy, funny soundtrack. At some point the characters “turn wild” and swap out winning symbols from the game, replacing them with new symbols. Another classic arcade game from the golden era based on fairy tales is the franchise Dragon's Lair. The game is inspired by children's stories - the main character, Dirk the Daring, is a knight who must save Princess Daphne from the lair of a dragon named Singe. On his quest through the game's universe, the protagonist must journey through the castle of the dark wizard Mordroc, avoiding the enchanted monsters and obstacles before reaching the lair of the dragon where he confronts the final boss. The game broke new ground when released in 1983 as it was one of the first games released on LaserDisc. The game was an impressive feat of technology for its time and the new LaserDisc format allowed for more complex animation than earlier arcade games that featured 'sprites' made of a small cluster of pixels as their main characters. Dragon's Lair enchanted players with its animation running at 24 hand-drawn frames per second, which were created in a painstaking and costly production. Some of the most popular classic arcade games have inspired today’s cutting-edge gaming scene. The wave of arcades full of fairy tale games was the genesis of the widespread fantasy genre that we see in hugely popular video games today such as the Fable series.